The method of mounting a nest box is as important as the design of the nest box. See Nest Box Design to determine the proper nest box for each species of cavity nester. Mounting to a tree is not a good idea, as squirrels and other predators will be able to access the nest box. Furthermore a nest box mounted on a tree is difficult and dangerous to monitor. Mounting on wooden posts or steel T posts also allow climbing predators to access the nest box. A much better technique is to mount the box to EMT conduit. 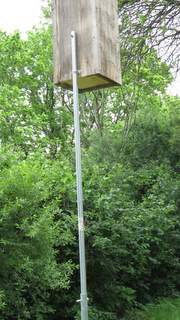 For nest boxes that need to be mounted 10 feet high, a telescoping pole should be used. The kind of bird will determine the method used to mount the nest box. Use the following table to determine which mounting method to use. The box weight and mounting height will determine the method used for mounting the nest box. 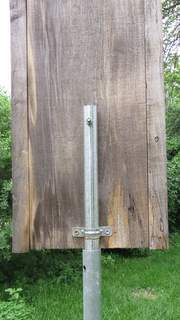 One of the best objects to attach Nest Boxes is a metal post. 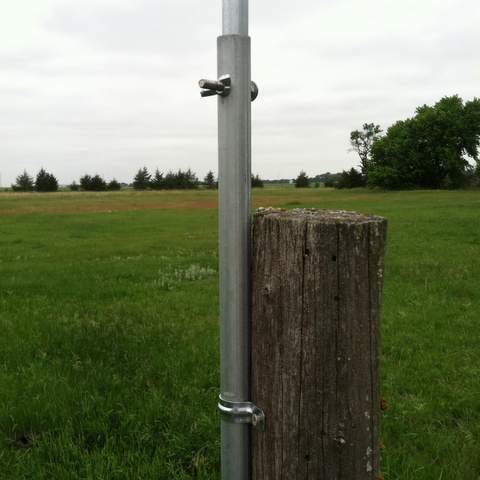 Different metal posts include steel pipe, EMT conduit, and steel T posts. Do not mount houses on trees as predators can climb trees and reach in and get the adults and nestlings. Attaching a nest box to a tree with a nail or screw will also damage the tree. Mounting on wooden posts also allows predators to climb to the nest box. 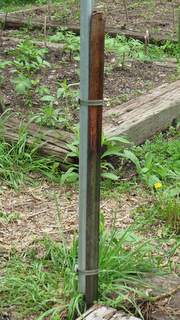 If a wooden post is used, a baffle MUST be installed on the post. Mounting directly on steel T fence posts also allows predators to climb to the nest box. A baffle MUST be installed on a T post. Open area at least 10 feet from tree branches. Predators can use tree limbs to access nest boxes. Away from over hanging tree branches. Predators can leap from above. Clear of vegetation below the nest box. Predators can climb vines and other plants to get to nest boxes. Some species like to nest against buildings. The Carolina Wren is one bird that seems to prefer nesting on man-made structures. Most light weight nest boxes can be mounted on a 5 foot section of ½ inch EMT conduit. 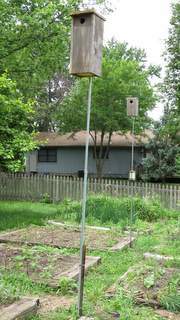 The 5 foot mounting height is agreeable to small cavity nesting birds such as bluebirds, house wrens, and chickadees. It also allows for easy monitoring of the nest boxes. Follow these instructions for mounting the nest box to the conduit and placing on the rebar. Drill a 3/16 inch hole located an inch from the top through the conduit. Drill a 3/16 inch hole in the center of the back of the nest box. Connect the conduit to the nest box by inserting a washer and a 2 inch machine screw from the inside of the nest box and into the hole drilled through the conduit. Tighten house to conduit with a nut. 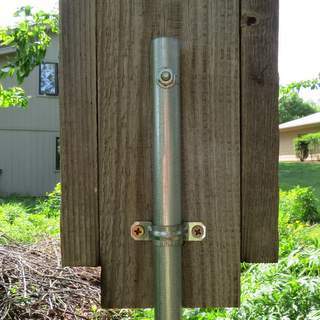 Attach conduit strap to lower portion of the nest box with two #6 screws. Position the conduit strap so the screws that hold the strap to the nest box will screw into the base of the box. Place the conduit coupler at the end of the conduit that will be closest to the ground. Tighten the original coupler screw to the conduit. Replace bottom coupler screw with longer replacement screw. Dial 811 to have all of your underground utilities marked. It is a free service. Drive the rebar into the ground about 2' leaving at least 1' about ground. Slide the conduit/coupler assembly over the rebar. Face the house the desired direction and tighten bottom coupler screw to rebar. This keeps the mounting pole from rotating on the rebar. Some birds' nestboxes, such as for flycatchers and woodpeckers, need to be mounted 10' high. This can be done by combining a 5 foot length of 3/4 inch conduit with a 5 foot length of 1/2 inch conduit to form a telescoping mounting pole. Even birds that will nest at 5' will often prefer nesting at 10'. With this method, the nest box is mounted to a 5 foot length of 1/2 inch conduit. The 1/2 inch conduit is mounted to a 5 foot length of 3/4 inch conduit. A hole is drilled through both pieces of conduit with 12 inches of overlap to form a telescoping pole. Drill the hole in the 3/4 inch conduit one inch from the top. Drill the hole in the 1/2 inch conduit 11" from the bottom. Combined they will have 12" of overlap and create a telescoping pole. A 1/4 inch carriage bolt is used to secure the two pieces of conduit together. When the bolt is removed the top portion of the pole can be removed or lowered into the lower conduit. The 3/4 inch conduit is mounted to a 4 feet length of 5/8 (#5) rebar using a similar method as for the half inch conduit to half inch rebar. 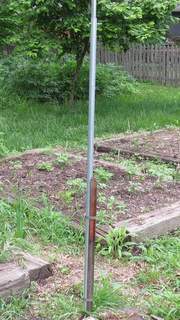 If you already have a wooden fence post, a telecoping pole can be mounted to it instead of using a piece of rebar. Instead of using a 5' (60 inches) section of conduit for the lower half of the telescoping pole, use a 20 inch length of conduit. 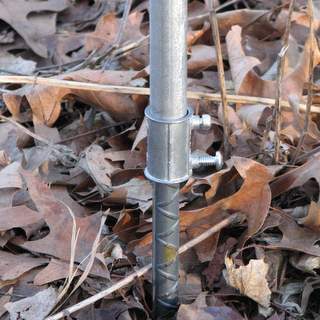 Follow these instructions for making a telescoping pole that attaches to a wooden post. Hold the conduit to the top of the fence post. 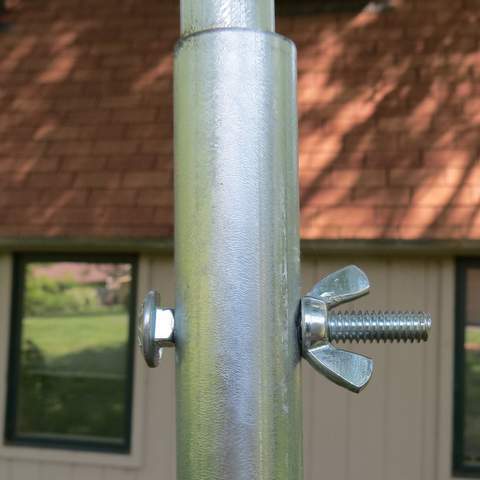 Make sure the hole that receives the bolt is above the top of the fence post. 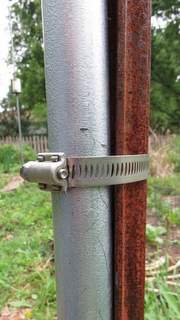 Connect the conduit to the post with two conduit straps using wood screws. Slide the 1/2 inch conduit/house assembly into the 3/4 inch conduit that is mounted to the post. Flickers, Screech Owls, Kestrels, and Wood Ducks all require heavy nest boxes. The box is mounted to a 5' length of ¾" EMT conduit. To attach the conduit to the box, drill a ¼" hole 1" from the top end of the conduit. About 12" from the bottom of the nest box, drill a ¼" hole through the back of the nest box. Bolt the nest box to the conduit. Use a washer on the inside of the nest box so that the bolt doesn't damage the wood. Add a ¾" conduit strap near the bottom of the nest box and secure it to the conduit. The ¾" conduit is mounted to a 5' length of 1" conduit. A hole is drilled through both pieces of conduit with 12" of overlap. Drill the hole in the 1" conduit one inch from the top end. Drill the hole in the ¾" conduit 11" from the bottom end. When combined the ¾" piece of conduit will telescope within the 1" conduit. There will be 12" of overlap between the two pieces of conduit. A ¼" carriage bolt is used to secure the two pieces of conduit together. When the bolt is removed the ¾" conduit portion of the pole can be removed or lowered into the 1" conduit. Attached the 1" conduit to a steel T post with hose clamps. 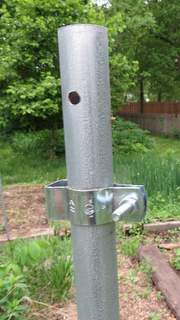 One advantage of using a T post and hose clamps is the nest box can be rotated in any direction. The combined length of the T post, 1" conduit, ¾" conduit, and the nest box places the top of the box at about 10 feet from ground level. In 2014, squirrels were not a problem in my flicker nest boxes. I didn't think they could climb the slippery conduit but in 2015 that theory was proven wrong. Not only will squirrels climb the conduit to go in nest boxes, they will chew on the holes to enlarge them. They built nests in my flicker nest box as well as my screech owl nest box. Some friends suggested using an inverted 1 gallon can to keep the squirrels from climbing the conduit pole. This is an in expensive squirrel baffle and it works like a charm. 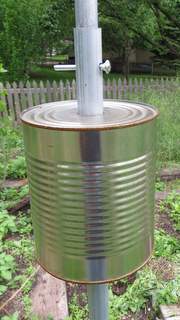 To use the can squirrel baffle, I took a 1 gallon can and drilled a 1 1/4" hole in the top using a hole saw. I also placed a 1" conduit hanger on the 1" conduit below the bolt that holds the telescoping pole in place. The can rests on the conduit hanger. The squirrels climb up the can and aren't able to climb past the can. When locating your nest box, Be sure the it isn't located too close to tree limbs. Squirrels can leap from tree branches to nest boxes. Once your nest box is mounted properly, be sure to monitor the nest box regularly. Many problems can be rectified by proper nest box monitoring. Learn more about Nest Box Monitoring. The use of a proper nest box design will help to attract desired birds to nest boxes. Learn more about Nest Box Design.